The Taliban movement of Afghanistan has published the first biography of its founder and leader, Mullah Omar. Here is the integral text of this document. The biography of the leader of Islamic Emirate Ameer-ul-Momineen, Mullah Mohammad Umar ‘Mujahid’ (May Allah safeguard him). 16th of Aries 1375 AH (solar) i.e. 4th April 1996 AD is a momentous day in the history of our Muslim people. Nearly two decades ago on this same faithful day, one thousand and five hundred scholars, dignitaries and Jihadi leaders of Afghanistan approved Mullah Mohammad Umar ‘Mujahid’ as the leader of the Islamic Emirate, gave an oath of allegiance to him and conferred the title of ‘Amir-ul-Momineen’ on him i.e. leader of the pious believers. In the official almanac of the Islamic Emirate, this day has its own significance due to that historical event which subsequently is being commemorated by the Cultural Commission of the Islamic Emirate by publishing special articles and essays on this auspicious occasion. As the publication of an inclusive biography of the leader of the Islamic Emirate was the urgent demand of our numerous colleagues especially the writers and researchers, the Cultural Commission of the Islamic Emirate decided to commemorate that historical occasion by publishing a comprehensive biography of His Excellency, the Amir-ul-Momineen, Mullah Mohammad Umar ‘Mujahid’ (may Allah safeguard him). For the prevention of false propaganda by a number of spurious writers, analysts and some biased circles and to depict a clear picture to the writers and ordinary people, we draw the life-sketch of His Excellency, the Amir-ul-Momineen, in the following lines. Mullah Mohammad Umar ‘Mujahid’, son of Moulavi Ghulam Nabi, grandson of Moulavi Mohammad Rasool and the great grandson of Moulavi Baaz Mohammad was born in 1339 AH (solar) i.e. 1960 AD in a religious and learned family of Chah-i-Himmat village of Khakrez district in Kandahar province of Afghanistan. His father, Moulavi Ghulam Nabi (late) was also born in Khakrez district and had received his early education in the traditional religious institutions and circles of this area. He was a well-known and respected erudite and social figure among the masses due to his indefatigable efforts in educating and guiding the people to the right path of Islam. Two years after the birth of Mullah Mohammad Umar ‘Mujahid’, his father migrated from Khakrez district to Noday village of Dand district of this same province and remained there till his last in spreading religious education among the local people. He died in 1344 AH (solar) i.e. 1965 AD in that area and was laid to rest in the old famous graveyard of Taliban in Kandahar city. After the death of his father, Mullah Mohammad Umar ‘Mujahid’ shifted at the age of five along with his family members from Dand district of Kandahar province to Deh-Rawud district of Uruzgan province where he started his early life under the supervision of his uncles Moulavi Mohammad Anwar and Moulavi Mohammad Jumma. At the age of eight, Mullah Mohammad Umar ‘Mujahid’ joined the primary madrassa of Shar-i-Kohna area in Deh-Rawud district to get religious education. This madrassa was supervised by his uncle, Moulavi Mohammad Jumma and Mullah Mohammad Umar ‘Mujahid’ also started his early education from him. Both of his uncles, particularly Moulavi Mohammad Anwar, played a key role in his religious teaching and training. Mullah Mohammad Umar ‘Mujahid’ successfully completed his primary and middle level education from this madrassa. While eighteen, he started acquiring the traditional higher religious studies in the region but could not complete them due to the malicious communist coup d’état in 1978 AD in Afghanistan. Mullah Mohammad Umar ‘Mujahid’ belongs to the ‘Tomzi’ clan of ‘Hotak’ tribe which comprises a large part of Pashtuns which has delivered eminent Islamic statesmen, national and Jihadi heroes like the legendary Islamic figure of ‘Haji Mirwais Khan Hotak’. Great Ghazi Haji Mirwais Khan Hotak (may Allah bless him), who is remembered with the venerated title of ‘Mirwais Nika’ (i.e. Mirwais, the grandfather) by Afghans, liberated Afghanistan from the tyranny of ‘Safavid’ dynasty in 1712 AD and laid down the foundation of a sovereign and independent Islamic state for Afghans. Professionally, the family of Mullah Mohammad Umar ‘Mujahid’ comprises of scholars and teachers of religious studies. They devoted all their lives to serving the sacred religion of Allah Almighty, to promoting religious knowledge and to educating the Muslim masses ideologically. Therefore they were deeply admired in their area and spiritually, they were considered the most dignified and social figures of the society. The birth of Mullah Mohammad Umar ‘Mujahid’ in such a spiritual and learned family and his upbringing under the direct patronage of his well-educated and ideological patrons deeply cultivated in him the ability to grow as a sincere Mujahid, a compassionate and vigilant Islamic and national figure who could emancipate the Afghan society from tyranny, corruption and injustice and preserve our beloved homeland (Afghanistan) from the imminent danger of disintegration. His brothers, uncles and all other family members are ‘Mujahidin’ and four of his family members have already sacrificed their lives as martyrs in the path of Allah Almighty. Mullah Mohammad Hanafia, the uncle of Mullah Mohammad Umar ‘Mujahid’ was the first one who was martyred on 7th October 2001, the starting date of the brutal bombardment of American invaders. Mullah Mohammad Umar ‘Mujahid’ was in his early twenties when the communists usurped control of Afghanistan through a bloody military coup d’état. It was a time when it became nearly impossible for Mullah Mohammad Umar ‘Mujahid’ like all other heedful students to continue their studies as the starting encounter of atheist communists was against the scholars, Taliban, students and other Muslim intellectuals throughout the country. At that time, Mullah Mohammad Umar ‘Mujahid’ decided to abandon his higher studies unfinished. He left madrassa and turned towards Jihadi front to discharge his religious obligation. He started his Jihadi struggle under a well-known Jihadi organization of ‘Harkat-i-Inqilaab-i-Islami’ (Islamic Revolutionary Movement) in Deh-Rawud district of Uruzgan province. After spending a while in this district, he earned a reputation for being a valiant Jihadi figure who played an active role in several military operations against the communists in various parts of that district. Due to his Jihadi prominence and a successful role in various Jihadi operations, he used to get the unanimous consent of all the Mujahidin of different parts and groups to be their commander in Deh-Rawud district for leading large-scale offensives against the enemy and he executed exceptionally successful operations in which he was wounded several times. He participated in many confrontations for more than three years along with his local Mujahidin against the invading Russians and their internal communist puppets. The companions and commanders of his Jihadi front say that Mullah Mohammad Umar ‘Mujahid’, in-spite of being young, was efficient enough to discharge any responsibility or task as he was bestowed with strong physical composition and potency. Later in 1983 AD, he went to ‘Maiwand’ district of ‘Kandahar’ province along with his Jihadi colleagues for the better co-ordination of Jihadi activities and continued his armed struggle against the Russian invaders and their internal stooges under the leadership of famous Jihadi commander ‘Faizullah Akhunzada’ who belonged to ‘Harkat-i-Inqilab-i-Islami’ (The Islamic Revolutionary Movement), one of the seven well-known Jihadi organizations of that time. Due to his successful role as a local Jihadi commander in numerous Jihadi operations and his efficiency and distinction in military tactics, he drew the attention of the then Jihadi organizations and eventually, he was permanently given the responsibility of a Jihadi front through ‘The Islamic Revolutionary Movement’ headed by (late) Moulavi Mohammad Nabi Mohammadi. From 1983 to 1991, Mullah Mohammad Umar ‘Mujahid’ executed very successful operations in the suburbs of ‘Maiwand’, ‘Zhari’, ‘Panjwai’ and ‘Dand’ districts of Kandahar province which were vital Jihadi centers and Mujahidin used to be involved in fighting the enemy on a daily basis. Similarly he personally and directly participated in several victorious operations against the Russian invaders on the main ‘Kabul-Kandahar’ high way in the suburbs of ‘Shahr-i-Safa’ and ‘Qalat’ cities of Zabul province. His preferred weapon of choice was the ‘RPG-7’, which was simply called ‘Rocket’ among the local Mujahidin, as he was proficient and an expert in using this weapon. It is worth mentioning that ‘Maiwand’, ‘Zhari’ and ‘Panjwai’ districts of Kandahar province were areas of intense fighting during the Jihad against communism which turned the tide and brought about Russia’s defeat and withdrawal. Such a large number of tanks and other military vehicles were destroyed on the main ‘Kandahar-Herat’ highway that the enemy had erected walls made from these wreckages on both sides of the road to protect them from Mujahidin assaults. Mullah Mohammad Umar ‘Mujahid’ was wounded four times in confrontational Jihadi operations against the Russians and in one of these operations, he lost his right eye. Mullah Mohammad Umar ‘Mujahid’ was known as a prominent and distinguished Jihadi commander who played a crucial and decisive role in numerous Jihadi operations against the Russian invaders and their internal communist puppets in Kandahar and its neighboring provinces. In the following lines, we will mention some events and anecdotes by his Jihadi companions against the Russian invaders. 1. The enemy had a strong post inside Kandahar province which was known as ‘Budwan’ post. A military tank was stationed by the enemy at a strategic juncture near the post which created a great hurdle for the Mujahidin as it could target any line-of-fire easily. Mujahidin tried their best to destroy this tank but failed to succeed. Eventually Mullah Mohammad Umar ‘Mujahid’ was called in for help from ‘Sang-i-Hisaar’ area. He hit and destroyed this tank of ‘Budwan’ post with his ‘RPG’ rocket launcher which was a tremendous success for the Mujahidin at that time. 2. During the Holy Jihad against Russians in ‘Mahalla-Jaat’ area of ‘Kandahar’ province, Mullah Mohammad Umar ‘Mujahid’ was accompanied in a confrontation with the enemy by ‘Shaheed Mullah Ubaidulla Akhund’ who was later appointed the Defense Minister of the Islamic Emirate and the Deputy of ‘Ameer-ul-Momineen’ (i.e. the leader of the pious believers) after the American invasion. A large number of enemy tanks and other military vehicles were destroyed by them. The following day, visitors were bewildered and could not believe that the enemy was repelled. They thought that the enemy forces were still intact even though a large number of their vehicles were burnt and the remaining ones were pushed back to their previous locations. 3. A convoy of Russian military tanks was passing through ‘Sang-i-Hisaar’ area of ‘Zhari’ district on the main ‘Kandahar-Herat’ highway. Mullah Mohammad Umar ‘Mujahid’ was accompanied by ‘Mullah Biradar Akhund’ who later became the Deputy of the Islamic Emirate of Afghanistan, while they only had four RPG rounds. Unwavering they attacked the convoy and destroyed four military tanks with these rounds. 4. Mullah Biradar Akhund, a close friend of Mullah Mohammad Umar ‘Mujahid’ during the Holy Jihad era against the Russians, said that such a large number of Russian tanks were destroyed by him that his friends are unsure about its exact number. In 1992, after the collapse of Najeeb’s communist regime and with the eruption of factional fighting throughout the country, like all other righteous Mujahidin, Mullah Mohammad Umar ‘Mujahid’ laid down his arms, set up a religious madrassa next to the mosque of ‘Haji Ibrahim’ in ‘Gishaan’ village of ‘Sang-i-Hisaar’ area in Maiwand district of Kandahar province and settled there. He restarted his unfinished religious studies along with some other Jihadi colleagues after a long and difficult fourteen year struggle. This was a time when deadly factional fighting had engulfed the entire country including the capital city Kabul. Some factional warlords, purely for the sake of their personal interests, violated the objectives of the Holy Jihad against Russians and brought humiliation to the aspirations of one and a half million Afghan martyrs who sacrificed their lives for defending Islam and establishing an independent Islamic government in their beloved homeland. Instead of establishing an Islamic system of life in order to fulfill the long awaited aspirations of the whole Mujahid nation of our country, internal factional fighting broke out. The fact was that Mujahidin were weakened and sidelined through a pre-planned conspiracy. Some of the prominent communist figures who should have been trialed were unfortunately given shelter by some former Mujahidin commanders and some other warlords began looting, violating the people and plundering the country in an organized fashion. In this way, the whole nation and country was plunged into a state of anarchy and lawlessness which was not experienced by the Afghans throughout their past history. The life, honor and property of all pious Muslims were endangered. Self made check-posts and barriers of stubborn, ignorant and brutal warlords were found on the main roads and thoroughfares of the country. Not only a wishful amount of money was demanded by these warlords from our poor countrymen but the honor and chastity of our already oppressed people was also at stake at these barriers. The national assets of our country, the achievements of previous Holy Jihad and even the jungles and other natural and mineral resources were relentlessly exploited by those warlords who were unprecedented in our history. Not only was the fruits of fourteen year Jihad against the Russians endangered but the daily life of ordinary people was also at stake. Social corruption, killing, looting and plunder, oppressions, barbarism and the incessant sufferings of the Muslim masses were increasing daily due to the prevailing chaos and anarchy throughout the country. This situation deeply troubled righteous Mujahidin who had fought for the freedom, dignity and prosperity of the Muslim Afghan masses. Mullah Mohammad Umar ‘Mujahid’ who was living along with Jihadi colleagues in Maiwand district of Kandahar province was also deeply anxious about the prevailing anarchy like all other true Mujahidin. He observed that numerous barriers were erected on the main ‘Kandahar-Herat’ highway and the oppressed passengers, women and white-bearded elders were looted, disgraced and even killed in the broad day light by ruthless warlords. It is worth mentioning that the number of illegal barriers and check-posts had increased to an extent that the traders, bringing their merchandise from ‘Herat’ province to the border town of ‘Boldak’ in Kandahar province, used to unload their goods in Maiwand district due to unlimited demands of these barrier-holders. Then they used to transfer their goods through unknown desert routs to their destination after suffering intolerable hardships. Mullah Mohammad Umar ‘Mujahid’ and his colleagues were fully aware about the prevailing situation in Kandahar province where the brutal warlords were dispersed in each and every corner of the city. They were incessantly usurping the public as well as private properties and selling them for huge amounts of money. They erected their private markets on government lands. Moreover, they always used to fight among themselves on minor issues which caused great distress for the ordinary people. These endless sufferings of the helpless and oppressed people of our country compelled the true and righteous Mujahidin to bond together and find a solution for protecting the lives, honor and properties of the Muslims. Mujahidin started meetings and counseling amongst themselves. Mullah Mohammad Umar ‘Mujahid’ and his companions arranged their first meeting in ‘Zangawat’ area of Panjwai district in ‘Kandahar’ province involving the well-known and authentic local and regional Ulama (scholars). This gathering of Ulama headed by Moulavi Said Mohammad (known as Moulavi ‘Pasanai Sahib’), the arbitrator general of Mujahidin in Kandahar province during the Holy Jihad against Russians, told Mullah Mohammad Umar ‘Mujahid’ to stand and resist against this anarchy as he would be supported by all of them. This was the initial meeting of the Islamic Movement and Mullah Mohammad Umar ‘Mujahid’ laid down the foundation of his struggle against chaos and corruption on 15th Muharram 1415 AH (lunar) (i.e. 24th or 25th June 1994). The Islamic Movement launched their struggle and fight against corruption and anarchy under the leadership of Mullah Mohammad Umar ‘Mujahid’ which was widely welcomed by the true and righteous Mujahidin and ordinary masses. First, they liberated Kandahar province and then other vast areas of Afghanistan from the corrupt and wicked warlords. At that time, when major parts of Afghanistan came under the control of Islamic Movement of Taliban, a large number of Afghan Ulama, comprising more than 1500 religious scholars, convened a meeting in Kandahar city on 15th Dhul Qa’da 1416 AH (lunar) (i.e. 4th April 1996). They approved the leadership of Mullah Mohammad Umar ‘Mujahid’ and conferred the title of ‘Ameer-ul-Momineen’ (the leader of the pious believers) on him. On 6th Libra 1375 AH (solar) (i.e. 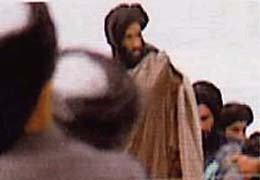 27th September 1996), Kabul city, the capital of Afghanistan also came under the control of the Islamic Emirate of Afghanistan and subsequently, the supremacy of the Islamic Emirate prevailed in ninety five percent territory of our beloved homeland including all the central and northern parts of Afghanistan. Kandahar city, 4 April 1996. Mullah Omar shows the legendary ‘Cloak of the Prophet Mohammed’ to a large gathering of Islamic scholars and in return receives the title of ‘Amīr al-Mu’minīn’ (Leader of the Faithful) . This is the only confirmed picture of Mullah Omar. The Islamic Emirate of Afghanistan, under the leadership of Mullah Mohammad Umar ‘Mujahid’ established an Islamic system based on the sublime rules and principles of Sharia Law. After a long interval, the world witnessed a practical model of an Islamic government once again. He preserved the country from disintegration and disarmed the unruly warlords which resulted in the restoration of exemplary peace and stability in the country which was deemed unattainable by the whole world including the United Nations. But (and there is great ‘But’) the arrogant infidel powers of the world could not tolerate this Sharia system established by the Islamic Emirate which became a thorn of their eyes. Therefore they adopted and initiated antagonistic behaviour towards it. They tried their best either to find or create lame excuses to overthrow this system and eventually they launched a joint military invasion against it. As a leading personality, Mullah Mohammad Umar ‘Mujahid’ has a unique and charismatic personality. Contrary to high ranking officials and leaders, he does not want to show off or boast. He is not eager or excited to speak if it is un-necessary to do so. And if needed, his words and sentences are keen, perceptive and logical. For instance in the early days prior to the American invasion, wide range propaganda was launched to demoralize Mujahidin and oust the Islamic Emirate. The Americans left no stone unturned and all the western media outlets, their radio stations and popular television stations were fully devoted to promoting American malicious objectives. “Allah is Almighty. Whether it is America or a tiny ant, it makes no difference for Him. America and her allies should listen carefully that the Islamic Emirate is not like one of the previous regimes whose Ameer (head) would flee the country; as it happened in the case of King Zahir Shah, the former monarch of Afghanistan, who sought asylum in Rome; nor will my soldiers (personnel) surrender to you. You should remember that these are well-organized Jihadi fronts. If the capital and other cities of the country fall in your hand and the Islamic government is ousted, instead of surrendering, our Mujahidin will spread to the countryside and go to the mountains. What will you do then? Inevitably, you will be caught and killed everywhere just like the Russians. Some people might not have understood these expressions of Mullah Mohammad Umar ‘Mujahid’ which were fraught with firm belief, devotion and sincerity but nearly fourteen years have elapsed since this huge one-sided battle was launched and the American super power, NATO alliance and other allied forces are on the verge of defeat by the empty handed but devotional and determined Mujahidin of Mullah Mohammad Umar ‘Mujahid’; those gentlemen might now have understood the simple but historic expressions of our leader. Similarly at the beginning of the American invasion, he declared to the Afghan masses in a radio broadcasted speech while alluding to the foreign invaders and their internal stooges that weapons can bring death but it cannot defy it. This sentence might have been a meaningless and insignificant composition of words for some people but in the previous thirteen years, the implications of these simple words were practically observed when the brutal foreign invaders relentlessly killed a large number of innocent people with the help of their advanced technology and weapons of mass destruction but they could not turn death away from their own soldiers who are incessantly being killed, wounded and incarcerated for the last thirteen years by the heroic Mujahidin under the leadership of Mullah Mohammad Umar ‘Mujahid’. It is an important fact that even the arrogant foreign invaders, who are fully equipped with all kinds of modern weapons and other facilities, plainly admit that thousands of their soldiers were killed and wounded inside Afghanistan in this futile war. According to Mullah Mohammad Umar ‘Mujahid’, it is better to speak less and do more as our religion emphasizes deeds over words or ideas. His life is totally free from ceremonies and un-necessary protocols. He has adopted a simple and plain style in all aspects of his life. Simple dress, simple food, simple talk, frankness and informality are his natural habits. He does not stand on ceremonies and dislikes ceremonial people. He considers determination, prudence and sincerity as the basis of all progress and the more prudent, sincere and decisive one is among his colleagues the more he is admired and loved by him. Similarly he is used to facing hardships, sufferings and ups and downs of life. Whatever the magnitude and intensity of the tragedy or trouble might be, he remains tranquil and does not lose either temper or courage. During varying conditions of jubilation and jeopardy, triumph and failure, he remains serene and self-controlled. He deeply respects scholars and other elders. Gravity of manner, dignity, modesty, reverence, reciprocal respect, sympathy, mercy and sincerity are his natural traits. Strong determination, trusting in only One Allah the Almighty and a strong belief in what is ordained by Him are the distinguishing features of his life. This is the reason that Mullah Mohammad Umar ‘Mujahid’ is deeply loved and revered by his followers and Mujahidin which has nothing to do with his apparent worldly status. It has been nearly thirteen years that our beloved homeland Afghanistan is invaded and occupied by the brutal foreign invaders but his devoted and sincere Mujahidin follow his verbal and written commands and decrees as reverently as they did it in his presence and do not refrain from even sacrificing their lives to execute his orders. Mullah Mohammad Umar ‘Mujahid’, as the founder of the Islamic Movement of Taliban and a leader of the Muslims, is fully cautious and takes keen interest in all the issues relating to the Muslim Umma. He has always defended the issue of Al-Aqsa Mosque (the first Qibla or prayer direction of early Muslims) and the vindicated claim of Palestinian Muslims. He has taken a clear stance and supported all issues of Muslims in all parts of the world. He considers it the duty and obligation of every Muslim to liberate the Al-Aqsa Mosque from the occupation of Zionist Jews. Mullah Mohammad Umar ‘Mujahid’ feels pity and shares the sufferings of all Muslim people. His sincerity, sympathy, brotherhood and co-operation with the Muslim brothers of the world are not restricted only to slogans but rather he has proved it practically and in the real sense of all these terms. Ideologically, Mullah Mohammad Umar ‘Mujahid’ belongs to the main ‘Ahl-i-Sunna wal Jamma’a’ (the believers in Quran, traditions of the Holy Prophet, peace be upon him, and the consensus of Muslim Umma). He is the imitator of Hanafi school of thought. He is severely opposed to all heresy or heterodox opinions. He never likes sectional, ideological and factional differences among the Muslims. He always recommends and insists on Islamic and ideological unity and co-operations to his followers and all other Muslims as the ideological unification among the Muslims is the utmost demand of this crucial time. Following the path of our pious predecessors and leading scholars in the light of Quran and Hadith (i.e. the traditions of our Holy Prophet, peace be upon him) is considered the only path of salvation by him for the Muslim Umma. Mullah Mohammad Umar ‘Mujahid’ who has spent most part of his life in acquiring religious studies, Jihad, invitation and guidance towards Islam, might be the poorest person who has taken no personal advantage from ‘Bait-ul-mal’ i.e. ‘the public treasury of the Muslim state’ among the contemporary leaders of Afghanistan. He has not accumulated any wealth to spend on a luxurious life in the previous Jihad era against Russians by taking disadvantage of his personal influence, nor has he lived lavishly in the seven years reign of his overall control during the Islamic Emirate of Afghanistan. Mullah Mohammad Umar ‘Mujahid’ even now does not own an ordinary residence neither has he any cash deposits in any foreign bank accounts. In 1999 when unilateral and ruthless economic sanctions were imposed by the United Nations on the oppressed people of Afghanistan and all the foreign bank accounts of Taliban leadership were frozen, Mullah Mohammad Umar ‘Mujahid’, the highest ranking official, being the head of the Islamic Emirate of Afghanistan, had no bank accounts either inside the country or outside nor anywhere else with any assumed name. During the reign of the Islamic Emirate, when his residence came under the deadly attack of the brutal enemy which resulted in the martyrdom of his family members along with several other innocent people, some officials of the Islamic Emirate decided to build another residence and an office for the leadership of the Islamic Emirate in the north western part of Kandahar city, near the hill of ‘Baba Sahib’ for his safety purposes as there was no residential area in the suburbs of this location. This residence was also administered by the ‘Bait-ul-mal’ as one of its general properties therefore it too was not considered the private ownership of his Excellency. “You are the inheritors of the Holy Prophet (peace be upon him) and you have thrown a heavy responsibility upon my shoulders. In reality, you will be held responsible for my steadfastness as well as deviation from it. Besides the natural silence of Mullah Mohammad Umar ‘Mujahid’, he is affable and has a special sense of humor as he never considers himself superior to his colleagues whatever their status might have been. He treats them cheerfully, cordially, compassionately and with reciprocal reverence. In most of his meetings, he usually speaks about Jihad. In the present crucial conditions and regularly being tracked by the enemy, no major change and disruption has been observed in the routine works of Mullah Mohammad Umar ‘Mujahid’ in following and organizing the Jihadi activities as the leader of the Islamic Emirate. He begins his working day with the prayers to Allah Almighty and recitation of the Holy Quran. In free time, he studies various commentaries of the Holy Quran and traditions of the Holy Prophet (peace be upon him). He keenly follows and inspects the Jihadi activities against the brutal infidel foreign invaders. In organizing and reshuffling the Jihadi and military issues, he delivers his orders in a specific way to his Jihadi commanders. He regularly follows the Jihadi publications and other international media resources to judge his victories and likewise other issues against the foreign invaders. In this way, he remains in touch with the day to day happenings of his country as well as the outside world. These activities form his basic daily life in the present circumstances. The Islamic Emirate of Afghanistan was established as an Islamic Movement under the leadership of Mullah Mohammad Umar ‘Mujahid’ on 15th of Muharram 1415 AH (lunar) (i.e. 24th June 1994) which subsequently passed through several crucial stages while enjoying the support thousands of scholars, Mujahidin and the pious masses of our country. It had the honor of implementing the Islamic Sharia in ninety five percent land of our beloved homeland. It is still controlling vast areas of the country and is involved in armed resistance against the infidel western invaders as a pure and lofty Islamic Emirate. Mullah Mohammad Umar ‘Mujahid’ is still the leader in the present hierarchy of the Islamic Emirate of Afghanistan. His deputy, the leading council, judiciary, nine executive commissions and three other administration organs are active under his leadership which form the warp and woof of the present setup of the Islamic Emirate. The deputy of the Islamic Emirate, besides inspecting and assessing all the subordinate organs, conveys their working reports to the ‘Ameer-ul-Momineen’ and communicates the orders and decrees of the leader to all the concerned organs and authorities. The leading council of the Islamic Emirate consists of twenty members who are appointed by the leadership and convene their meetings under the deputy of the Islamic Emirate. This council discusses and makes decisions about all political, military, social and other critical issues. Judiciary of the Islamic Emirate has a separate and wide setup which comprises of primary courts, courts of appellation and court of cassation which are busy in discharging their own responsibilities. To meet the needs of present circumstances, nine different commissions are set up in the present hierarchy of the Islamic Emirate. Due to ongoing Jihadi requirements, the largest one is the military commission which consists of nine sub-circles. This commission is responsible for appointing governors or military in-charges for all 34 provinces of Afghanistan, military in-charges of all districts, setting up sub-commissions which are subsequently responsible for all military and civil affairs of their respective provinces and districts. The Islamic Emirate controls a major part of Afghanistan as a well-organized and working system for over two decades under the leadership of Mullah Mohammad Umar ‘Mujahid’ which has sincerely implemented the Islamic system of life in all areas of its jurisdiction. Law and order is restored; lives, honor and properties of the Muslim masses are safeguarded. During this whole period of time, the Islamic Emirate has faced several challenges and adversities as the only active Islamic system of governance but it has successfully survived by the grace and benevolence of Allah Almighty through all these challenges and confrontations as it has proved its determination and steadfastness to its lofty principles throughout these adversities. May Allah Almighty protect and safeguard our leader! Dit bericht werd geplaatst in Afghanistan en getagged met biography, Deh Rawod, Dihrawud, Kandahar, mullah Omar, Mullah Umar, Taliban, Uruzgan. Maak dit favoriet permalink.